Full quantitative analysis is more difficult than the semi-quantitative work frequently performed with X-ray diffraction. Two methods for quantitative analysis are in common use – the Rietveld refinement method and the use of calibration standards. The Rietveld method is often termed the Gold Standard of quantitative analysis with accuracies in the 1% range, but use of calibration standards can give similar levels of accuracy. The difference, however, is that the Rietveld method is more widely applicable to a mixture of several phases, while the calibration standard method is limited to just 2 or 3 phases. Therefore, the Rietveld method is generally preferred as an all-purpose tool. 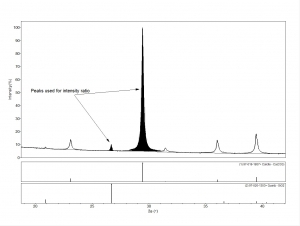 Figure 1 shows a portion of the experimental diffraction pattern of a mixture of Calcite (Ca(CO3)) mixed with trace amounts of Silica (SiO2). Individual data points are shown as discrete dots and the computed profile is shown as the continuous line. At the top of the Figure is shown the residual error between the computed and experimental curves. Finally, at the bottom of the Figure are shown the stick patterns for the phases identified. Once the phases have been identified and the necessary atomic information extracted from the database, a computed profile is calculated. Then, by use of a least-squares technique, the residual error is minimized by modifying the lattice parameters, the scale factors, atomic parameters such as the thermal vibrations, atomic positions, and occupancies. When the process is completed, the scale factors then provide the quantitative analysis. The method described in Example 1 is useful only when all of the details about the atomic and crystalline structure are known. In those cases where such information is not available, then the use of calibration standards is often used instead. In this method, a number of control samples are made from the pure materials over a composition range that overlaps the expected range in the target. Diffraction patterns are then prepared for each control sample, and the intensity ratio is prepared based upon two un-obscured peaks from each phase. In the example in Figure 2, an X-ray diffraction pattern from the Calcite/Quartz 2% mixture is shown. Figure 2. XRD pattern of Calcite/Quartz 2.0% mixture showing the non-overlapping peaks for the two phases used to generate to intensity ratio. One peak for each phase is highlighted and a ratio of the intensities is computed. This process is then repeated for the other synthesized control samples. 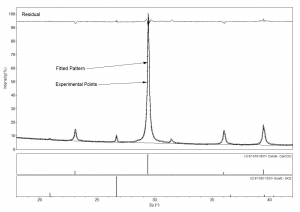 All of the data are used to construct a calibration curve in order to estimate the quantities of each unknown material through the measured intensity ratios.